Home > Full Sharing > Replace Eating with Ajapa Japa? From childhood, DevaVedanta always had a hard time with a bloated tummy, gastritis, skin sensitivities, indigestion, due to anxiety and bad eating habits (not eating the right food, not having enough liquids, not eating when hungry, etc). Her tummy problems were affecting her so much that she could not dress comfortably and would keep feeling physical discomfort. She went to doctors who prescribed pills, Ayurvedic doctors who helped her using therapies and taught her how to make lifestyle changes. Things improved health-wise for 2 years, but the same problems kept coming back off and on. DevaVedanta would feel tired and dizzy when she got hungry or felt like fainting. She would also feel angry towards herself, others and whatever situation she was in…if she couldn’t have a meal on time. It would ruin her day and a few weeks at times. Sometimes, she would be tempted by unhealthy foods like tea, coffee and rich foods like pizza. However, she was in control with her diet most of the time, and would not eat when she’s not hungry. She used to take up detoxing fasts twice every year. At the end of the fast, she would only have water and nothing more. But she noticed that she became very “small”, her muscles started shrinking and there was lots of burning sensations in her tummy. She had a feeling that she wasn’t doing this right and stopped this process after some time. From childhood, DevaVedanta never really liked to eat. She had to be forced to eat from young. Like billions, she was also taught that food is a basic necessity without which we’d die. It is basically what we work so hard for and also abuse our bodies and minds with. DevaVedanta had mostly eaten due to hunger. The next big reason to have food was to socialize with people…and also for occasional binging, snacking and “storing” food in the stomach for the future – she thought that eating more food than required might be useful when there was no food available! In April 2012, she attended Inner Awakening in Bidadi with her husband. Along with the process of Kundalini Awakening for the participants, Swami was initiating a group of close ashramites into the Nirahara Samyama. DevaVedanta and many other participants wanted to be part of this Samyama, but Swami mentioned that we were going through another process and will not be able to do it unless He is able to supervise us closely for 21 days. DevaVedanta was very inspired and awed by the Samyama, as many people who were part of the process were “foodies” and even people who are in charge of cooking in the Ashram, however they were not tempted to eat at all. One would think that a process like this would require motivation and discipline, but it also seemed to take away their desire to eat and “enjoy” food with their senses! Strangely, even during Inner Awakening, DevaVedanta felt very little hunger – but continued filling the stomach only because of Swami’s instructions. When DevaVedanta got home from Inner Awakening, she was only eating a small quantity and only once a day, even without doing the Samyama process formally. She felt so energetic and had no temptations to eat more. Later, Swami mentioned that some of us would be able to imbibe the group energy and the power of His words. When this Samyama became a success story with the ashramites, Swami started opening this possibility to all devotees, disciples and any willing open-minded participant all over the world via videoconferencing. 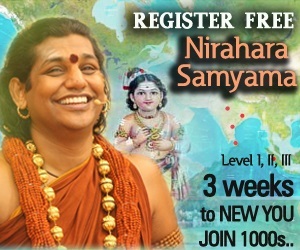 As usual, we jumped and registered ourselves at the opportunity given by Swami. The first time – we did this Samyama from home while Swami watched on 2-way videoconferencing. During that time, DevaVedanta felt the process to be very intense. During the meditations, she suddenly felt like she was sitting underneath the Banyan tree in Bidadi. She could even smell the scent of Sandalwood and a drop of water sprinkling on her head from the hall of her home, just like in Bidadi, under the Banyan tree! For 2 days, DevaVedanta continued the Samyama. She felt so much energy as if she was floating! She went to visit friends that day and there was intense movement in the body. However, she felt tempted to eat after that and also had to give up because she could not continue the process on 2-way during office hours. DevaVedanta didn’t want to give up as she started seeing the success stories of the 1st and 2nd batches of Niraharis. They had so much of energy! This gave her the confidence that she could also do it! The intensity grew stronger. After prayers to help make the Samyama possible for her during office hours, somehow DevaVedanta gathered the courage to take a long break from work to attend the Nirahara Samyama via 2-way videoconferencing, and then return to the office. She did this for more than 3 weeks at a stretch. With sincere intention, Swami made it all possible. The first process – we were still battling temptations to eat! When Swami gave us a break for 1 day to eat whatever we wanted, we went to a favorite restaurant to eat…lots! The second process – Up to 4 days, there was still a lot of temptation to eat favorite solid foods like pizza, cakes, etc. At this stage, DevaVedanta sometimes felt like giving up, but each time she felt that way, she would remember Swami and continue with Ajapa Japa, chanting the Guru mantra while focusing on the throat region. Then she started experiencing sweet nectar-like fluid flowing down her throat and a beautiful sensation on the 3rd eye area. She would feel very light, energetic and a sweet intoxication most of the time. This is when the interest towards solid food, eating, tasting, chewing food, getting tempted just by smelling others having pastries and cakes – all of these starting dropping. At this stage, she felt good about the smell of food, but looking at the food would not trigger any saliva production – the tongue and senses would not feel anything. “Food” suddenly just seemed like any other object. There was an incident once, where we went for a group Yoga class as someone baked pizza. Everyone was so affected by the smell and felt so hungry afterwards, but DevaVedanta just observed that she was very aware and didn’t feel tempted at all. She experienced that there was no connection between the smell, visuals and taste. At the end of this 2nd stage, Swami gave us 3 days of break-time to eat whatever we liked. The mind was ambitious to eat a million things, but by this time the body had decided that it didn’t like being treated like a rubbish bin. It was so happy and blissful that it wanted to be on liquids forever. No more tummy bloating, burning or acidity! DevaVedanta slept no longer than 5 hours, or sometimes 4.5 hours a day and felt so fresh from all of the energy Swami was infusing into us. 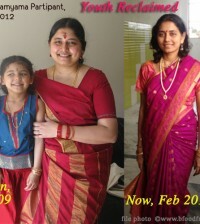 She walked uphill to the office for 20 minutes every day and there was so much lightness and no muscle wastage at all. In fact, she could feel her calf muscles building. The various Yoga postures that DevaVedanta struggled with in the past became effortless, the body just became flexible. DevaVedanta started thinking – could her eyesight be improving too? The third process – By now, DevaVedanta started noticing that she wasn’t having withdrawal symptoms of not having coffee, tea or even a hot drink each morning before beginning her work. Previously, she used to feel irritated if she couldn’t have a hot drink in the morning. While walking uphill every day, she could feel that she was one with nature and for the first time, she was acknowledging how magnificent trees and plants were – how they opened up to receive energy from all around and gave it back to us generously. Feeling connected with everything around her, she felt as if Swami was walking when she was walking. To be honest, DevaVedanta never believed that she could actually feel Swami’s presence or initiation via 2-way videoconferencing. But what she was experiencing made it very clear that it was all Swami’s initiation and DevaVedanta’s only part was to remain intense and open for Swami to work his magic. There was so much efficiency and intense action with work and home life – no more tired, lazy or sleepy eyes. No fatigue. DevaVedanta continued her exercise regime with more energy and enthusiasm, including going to the gym and doing Yoga without fail daily. Everything around her felt so effortless. Senses were sharp and more focused; there were lesser thoughts and more action. 11 days without solid food was a breeze, it wasn’t hard at all…it just became a lifestyle for a while. When the process ended, DevaVedanta went back to solid food – but it was very clear that she couldn’t even stick to one meal a day…she would eat once in a few days and have juices or soups in between. 2 months after the Samyama – one day, DevaVedanta’s spectacles broke. She wasn’t wearing spectacles for a few weeks while waiting to see the optometrist. Upon an eye-check up – to DevaVedanta’s and her optometrist’s astonishment, DevaVedanta’s power had dropped (improved) drastically from approximately 3.25 to 2.00. Although her eyes had totally different powers before, they have both stabilized now to 2.00. Her optometrist didn’t believe this and had to schedule another appointment to re-confirm this. In 20 years of DevaVedanta wearing spectacles, her power had not reduced at all – it was just getting higher. This was the first time it ever dropped, and very drastically! DevaVedanta was and is still inspired by Swami on continuous morning Satsangs about food, its relationship to our senses, society and how it impacts us. While we did the Samyama, Swami was also doing it with us, which made it all extra special and reassured us He is there following the same process as us. 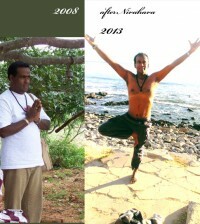 The lifetime Niraharis around the world were also a very big inspiration to DevaVedanta! Shortly after, we decided to go for the December Inner Awakening on the cruise ship. DevaVedanta had decided to do THE Samyama there for 21 days. DevaVedanta did her medical tests and explained to the process to the doctors who were confused as to why so many tests were needed. When the results came out, there were no deficiencies; the report indicated very good health and just Vitamin D deficiency, very common during cold weather. 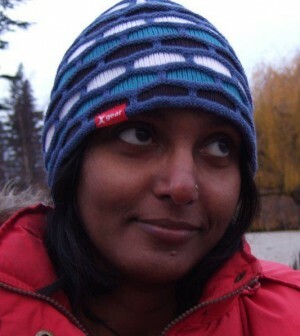 One month before leaving the country, DevaVedanta had the fear that she was going to “die” by not being able to eat again…she was afraid of living without solid food and thought she would be missing out in life. So, she started making all of her favorite foods and ate lots of them…of course, there was no hunger. To be honest, DevaVedanta did not feel as intense with THE Samyama on the cruise ship. Swami mentioned that we were to continuously have soups and juices while travelling on water, as it is not the same as being on land – being on sea water can dehydrate us. DevaVedanta is also vegan and found it hard to adapt with the juice and soup options on board, as there usually weren’t many vegan soup or juice options. However, the food on board was very delicious and tempting. Many times, DevaVedanta thought that she should just eat and do the Samyama later – but thinking about the priority and what was really important to her was Swami’s initiations. So, she decided to continue with the Samyama process and didn’t regret it. Many people were falling asleep because of all of the delicious food – but the Samyama participants were fresh in class. After returning from IA and THE Samyama, DevaVedanta started taking solid food again, but the capacity to eat again was never the same. When she returned home, she found that – just after a few days of eating solid food, it was hard to go back to liquids again…the mind was craving to start eat again, but the body was happy just the way it was! DevaVedanta’s weight was 48kgs and reduced to 40kgs. But it didn’t reduce further. When she ate, she would put on only up to 2 kgs at the most and the body would just stabilize its weight. Swami is continuously drilling us on the 4 tattvas and the tattva of authenticity hit DevaVedanta like an arrow. Why is she having so much fear about giving up solid food? What is stopping her? After so much of internal enquiry, she found that she had incompletions with certain types of food, meaning that she never fully ate those foods with her heart, mind and body – therefore the body kept craving for the same foods again and again. She also observed that she had certain incompletions with her parents and needed to spend time having meals with them and to go through the experience fully. She authentically decided to work on her fears and to nurture this gift of Nirahara given by Swami. At present, she eats solid food once a month and is slowly working her way to extending longer periods of being without solid food. Initially, it was tough but it is working now. The mind is just getting used to the fact that there is no use in having solid food when it is no longer required by the body. She often felt odd being with people or socializing (especially in the office during functions when there’s a lot of food) – but once she decided to be authentic to work on herself, she felt more comfortable with people around her and can explain about Nirahara easily to others – without hesitations or fear of judgement. From the time DevaVedanta completed Nirahara Samyama until now, she has never really eaten out of hunger. There is no longer gastritis, bloating, irritation or anger due to not being able to even have juice at times. When DevaVedanta is too busy to eat, she just does Ajapa Japa and doesn’t eat…that’s it, as simple as that. Taking solid food has always been out of choice. The mind’s choice. DevaVedanta is a lot happier, lighter, and free from food-cravings, hunger, health problems, society’s expectations and lots of other patterns – generally feeling free in life, free from the clutches of most of the senses. When we eat, we eat with our whole body – it’s actually sense pleasure. Where there is pleasure, there is an equal amount of pain. DevaVedanta also has better awareness and tolerance to pain and fear now compared to before. DevaVedanta has been sharing about Nirahara with people here – and by authentic listening, she has received some feedback on people’s perception about Niraharis and they way we project Nirahara. Most people tend to think of how amazing this is – but feel that this is not for them. They feel that they are not capable of being food for a few days and give up easily. DevaVedanta has explained that this is all the work of Swami and how He is able to transfer energy to us, even via 2-way videoconferencing! Some people respect us for being disciplined. Some are in disbelief and think we’re killing ourselves. 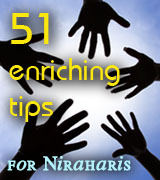 Some were interested to know if Niraharis can actually have children while not having solid food at all. Some think we are going after Siddhis, mystical powers and might become egoistic if we let this get into our heads. These were all valuable feedback we received by listening continuously to others, as each person had different opinions. DevaVedanta looks forward to continue sharing and explaining more to people about why we want to make Nirahara a lifestyle – that it is NOT about Siddhis, rather about controlling our senses and being more of a “hollow bamboo” to receive Cosmic energy for spiritual growth and progress in every area of life. DevaVedanta is learning a lot from sharing with people and is becoming more and more authentic with herself in terms of breaking patterns related to food. 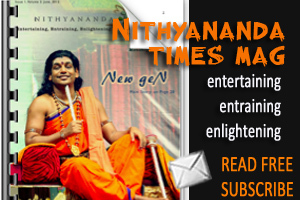 Ma Nithya DevaVedantananda (DevaVedanta) is authentically working on becoming a full-time Nirahari. There are so many beautiful experiences and benefits that she cherishes. What better gift than to make your body and self the instrument of one’s Guru and God? She thanks Swami for downloading, inspiring, sharing, initiating and storing this science for the whole world. 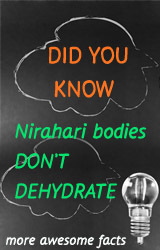 All dedicated Niraharis – you are all doing such a fabulous job recording and spreading this science to the world. May the Cosmos bless you all! Thanks for this opportunity to share!